Hunting for the best deals for all your Lexmark toners? Ordering all your replacement Lexmark T654n toner cartridges at here allows you to start saving a great deal of time and expense. Our business has a reduced price guarantee so you only get amazing discounts on all Lexmark T654n toner so that you won't have to go shopping in less affordable electronics suppliers We aim to meet the needs of each and every buyer by giving you great costs on all Lexmark T654n toner cartridges that have been constructed to rigid quality standards. You'll get fast and free delivery on all Lexmark toners. You can start saving today when you purchase bargain-priced Lexmark T654n toner cartridges when you use Cartridge Save's shop. However, you can buy a discount priced Lexmark T654n toner cartridge by calling the order line. Customer satisfaction is our top concern so we give you a comprehensive money back guarantee for all Lexmark T654n toner cartridges to ensure that you get 100% customer satisfaction. We're offering next day delivery, reliable cartridges along with the lowest possible prices. It will make sense to use the Cartridge Save for your T654n toner supplies. The Lexmark T654n network workgroup mono laser printer is a fairly compact device designed for small to medium-sized offices that need a more cost-efficient mono laser printer for handling various types of print jobs. The Lexmark T654n printer is simple to operate and boasts a secure network-friendly interface and direct-print capabilities, but it is expensive and lacks some essential features that could make it more efficient for workgroups. This simple yet efficient printer measures 17.2 inches tall, 20.1 inches deep, and 16.7 inches wide, making it fairly compact for a standard-sized work desk. Its standard ports include a USB 2.0 port in front and another one at the back for connectivity convenience, plus a standard Ethernet port and an expansion slot for the built-in 256MB memory. The Lexmark T654n laser printer runs on a 600MHz processor, and operation is seamless with an understated control panel with a 4-line mono display. 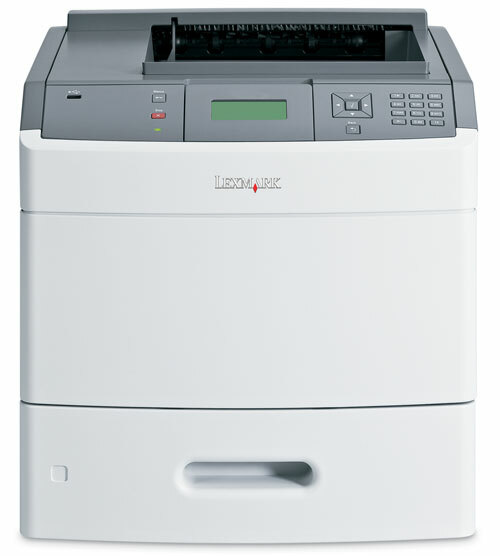 Speed is one of the main perks of the Lexmark T654n because it can print at up to 55ppm. Text documents look crisp in high 1200dpi or at a standard 600dpi resolution. The Lexmark T654n workgroup printer offers utmost security when being shared over a network, and users are given the option to integrate a hard disk drive and increase the memory to 1280MB. The T654n printer's maximum media capacity is up to 4,300 pages. It is possible to print directly from a USB flash drive. Lexmark produce an extra high capacity black Lexmark T654n toner cartridge which is very cost-effective and offers a yield of approximately 36,000 pages. This expensive printer is a huge investment because of potential high-priced additions, which a growing business requires. Apart from the high initial cost, the pricey consumables and additional paper trays make the Lexmark T-654n network laser printer quite expensive. Wi-Fi and gigabit Ethernet are only optional. The Lexmark T654n printer is quite heavy, too, at 23.4Kg. The lack of colour printing and memory card slots could limit its overall efficiency. The device doesn't have an Energy Star certification.